However, since you can’t back out of a purchase made at auction (without losing a lot of money), the process needs to be taken very seriously. You certainly shouldn’t just start bidding on houses willy-nilly. With enough preparation, you can grab a real bargain, so here’s our guide to buying a home at auction. Finding a local property auction house is easy – you can search online, or you can get in touch with your local estate agents, who will be able to refer you. Once you’ve found an auction you want to attend, get a hold of the catalogue to see what properties will be up for sale. If you’ve never been to an auction before, we recommend you sit in on a couple first, without bidding. That way, you can get a good idea of the atmosphere and what’s involved in the buying/selling process. When you’re ready to try and make a purchase at an auction, use the catalogue to research any properties you’re interested in. You will likely have a maximum of four weeks before the auction to view as many houses as possible. All purchases made at auction are final, so you want to make sure you’re happy with the property before bidding. Just like you would with a normal property, arrange to view the house at least once and be sure to take an architect or builder with you. Many houses at auction are in disrepair and will need updating or fixing, so you’ll need to know how much these things will cost. If you want to buy the house, it’s worth investing in a survey, especially if you’re looking to secure a mortgage. You also need to find out the value of the home; you can do this by searching for what other, similar, properties in the area have sold for recently. This will help you decide the maximum amount you’re willing to pay for the property, along with the estimated cost of any work or redecorating that needs doing. You don’t want to buy too big a project! When you register an interest in a property, you will be provided with a legal pack, which will detail covenants or legalities that may impact the property’s value. It’s vital to read through this carefully – if it contains anything you don’t understand, ask your solicitor or conveyancer to look over it and explain it to you. Unless you’re a cash buyer, you will need to secure a mortgage in principal before buying a property at auction. You also need a ten per cent deposit ready, because if you successfully purchase the property, this must be paid on the day. The remaining 90 per cent must be paid within 28 days; otherwise you will lose the house, as well as your ten per cent deposit. Additionally, you may also be made to cover the cost of the resell of the home and any shortfall should it sell for a lower price than you promised to pay initially. The auction house could choose to charge you interest for every day the house is not sold, too. By purchasing property at auction you are entering a legally binding contract, and you could lose a lot of money if you don’t pay up in time, so make sure you have the funds before bidding. Remember that you will still need to pay stamp duty on your purchase, along with the auction house’s fees. Therefore you’ll need to factor these costs in when working out your maximum bid. You’ll need to register upon arrival and to do so, two forms of ID are required, as well as proof that you can pay a ten per cent deposit. We recommend that you arrive at the auction house early, as they can get pretty crowded and you want to secure yourself a good seat. Wherever you decide to sit or stand, make sure the auctioneer can see you. Be sure to grab a copy of the addendum sheet; this will detail any last-minute changes made to the listings. Some lots may be withdrawn unexpectedly, so don’t be surprised if a property you were planning to bid on is no longer up for auction. Check the guide price too – if it’s higher than it was in the initial catalogue, it means there’s a lot of interest in the property. Prepare for a bidding war! This is the exciting part, which means it’s all too easy to get carried away. Make sure you don’t end up paying over the odds just because you want to beat whoever you’re bidding against. It can be difficult to let a home go, especially if you’ve fallen in love with it and you’ve paid out for surveys and searches to be conducted, but as previously explained, paying too much can have dire consequences. If you don’t trust yourself to stick to your budget, get someone else to go and bid in your place. You can also arrange to bid via telephone; just ask the auction house for details. When you want to bid, you must make it clear to the auctioneer. Don’t think that a sly wink will do. Either raise your hand or nod your head. Before your lot comes up, watch to see what other bidders do. Some properties have a ‘reserve price’ on them (a minimum price the vendor wants to home to sell for). If the reserve isn’t met, it doesn’t necessary mean you’ll miss out on purchasing the home. Speak to the auctioneer and see if a deal can be made – the seller may be willing to accept your final bid (reserves can often be a bit optimistic!). Make sure you leave your contact details with the auctioneer at the very least. That way, the sellers can get in touch should they change their mind. 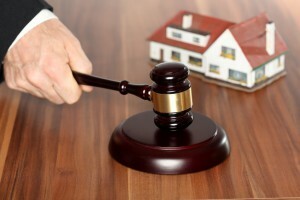 Buying your next home, or indeed investment, at auction really can save you a lot of money and hassle. Just like purchasing a home the traditional way, you’ll need to do a lot of research upfront, but on the flip-side, the property is yours as soon as you hear the gavel. We wish you the best of luck!